Westgate selects RP Visuals, Christie, and HB Communications to create 4,400 square foot video wall. ANAHEIM, California – Westgate Resorts, the industry leader in the development of themed destination resorts teamed with RP Visual Solutions (RPV) and Christie® to build the world’s largest LED Video wall inside the Westgate Superbook at the Westgate Las Vegas Resort & Casino. Working with HB Communications, RPV and Christie created an enormous curved array measuring 20 feet tall and 220 feet wide and comprising 1,640 2.5 millimeter Christie® Velvet™ LED tiles boasting over 65 million pixels. 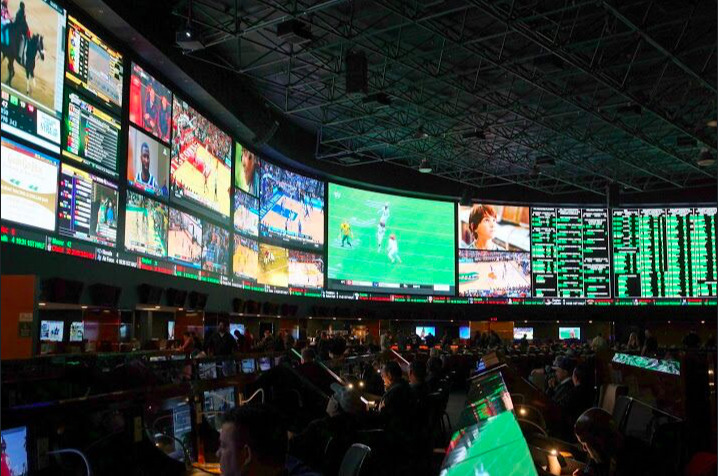 This enormous video wall spans the length of the world’s largest sports book creating a stadium-like experience unlike any other where every seat in the newly renovated Westgate Superbook is a “front-row” experience. RPV is renowned for creating architecturally integrated mounting solutions that are often large, curved, tilted, and or complex, and its newest project at the Westgate Las Vegas scores another touchdown. Along with the construction of this screen, the Westgate Superbook was completely transformed to create a stadium-like experience, including over 300 relaxation lounger chairs and a 100’ long curved bar that conforms to the shape of the screen. “To say it’s large is a giant understatement. When we were approached by HB Communications to fabricate this mounting structure for this project, we began the process of how to architecturally integrate this large, curved video wall structure into a reality. After designing came the task of how to install and deploy this configuration on-site. Partnering with HB and Christie to design this project is a huge honor. We knew that we had to exceed their expectations as well as Westgate’s to make this one-of-a kind fan experience a huge success,” said Randy Pagnan. Suitable for 24/7 operation and delivering high-resolution, bright and seamless visuals with wide viewing angles, Christie Velvet LED tiles can be configured into any size or shape for unmatched creative freedom. RPV has earned accolades for past projects with Christie including the University of Waterloo in 2013, which was hailed as the tallest array of Christie® MicroTiles®, and the curved four-foot tall by 58 foot long Christie MicroTiles video wall at the San Francisco Public Utilities Commission. “It is exciting to see this project become a reality. HB Communications is very proud to have been part of designing and integrating the largest indoor high resolution wall in the world. The image size and resolution are breathtaking and have totally transformed the Westgate Superbook into a “must see” venue. RPV has been phenomenal as have the entire team assembled to execute this scale project!” - Dana Barron, CEO HB Communications. rp Visual Solutions develops Innovative Visual Displays and Mounting Solutions requiring engineering excellence and knowledge to provide the best Visual Experiences. We offer Architecturally Integrated Displays for Entertainment Venues, Retail, Higher Education, Boardrooms, Simulation, and Emergency and Network Operations Control Centers. RPV is known for the very best in display optimization, install, and maintainability. Founded in 1980 by David A. Siegel, Westgate Resorts is one of the largest resort developers in the United States. Westgate features 28 themed destination resorts with over 13,000 luxury villas in premier locations throughout the United States such as Orlando, Florida; Park City, Utah; Las Vegas, Nevada; Gatlinburg, Tennessee; Myrtle Beach, South Carolina; Williamsburg, Virginia; Miami, Florida; Branson, Missouri; Mesa, Arizona; and Tunica, Mississippi. Most Westgate Resorts locations feature a variety of unique restaurant, retail and spa concepts, including Drafts Sports Bar & Grill, Westgate Smokehouse Grill, Edge Steakhouse, Westgate Marketplace & Deli, and Serenity Spa by Westgate. For more information about Westgate Resorts, visit www.westgateresorts.com. Contact Brandy Alvarado at Brandy@rpvisuals.com or 714-991-6400 for further information.